SAN FRANCISCO, Aug. 13, 2014 — In the future, working up a sweat by exercising may not only be good for your health, but it could also power your small electronic devices. Researchers will report today that they have designed a sensor in the form of a temporary tattoo that can both monitor a person’s progress during exercise and produce power from their perspiration. The team described the approach in one of nearly 12,000 presentations at the 248th National Meeting & Exposition of the American Chemical Society (ACS), the world’s largest scientific society, taking place here through Thursday. A brand-new video on the research is available at http://www.youtube.com/watch?v=3_D7JOd07M8&feature=youtu.be. The device works by detecting and responding to lactate, which is naturally present in sweat. “Lactate is a very important indicator of how you are doing during exercise,” says Wenzhao Jia, Ph.D. In general, the more intense the exercise, the more lactate the body produces. During strenuous physical activity, the body needs to generate more energy, so it activates a process called glycolysis. Glycolysis produces energy and lactate, the latter of which scientists can detect in the blood. Professional athletes monitor their lactate levels during performance testing as a way to evaluate their fitness and training program. In addition, doctors measure lactate during exercise testing of patients for conditions marked by abnormally high lactate levels, such as heart or lung disease. Currently, lactate testing is inconvenient and intrusive because blood samples must be collected from the person at different times during the exercise regime and then analyzed. Jia, a postdoctoral student in the lab of Joseph Wang, D.Sc., at the University of California San Diego, and her colleagues developed a faster, easier and more comfortable way to measure lactate during exercise. They imprinted a flexible lactate sensor onto temporary tattoo paper. The sensor contained an enzyme that strips electrons from lactate, generating a weak electrical current. The researchers applied the tattoo to the upper arms of 10 healthy volunteers. Then the team measured the electrical current produced as the volunteers exercised at increasing resistance levels on a stationary bicycle for 30 minutes. In this way, they could continuously monitor sweat lactate levels over time and with changes in exercise intensity. The team then went a step further, building on these findings to make a sweat-powered biobattery. Batteries produce energy by passing current, in the form of electrons, from an anode to a cathode. In this case, the anode contained the enzyme that removes electrons from lactate, and the cathode contained a molecule that accepts the electrons. 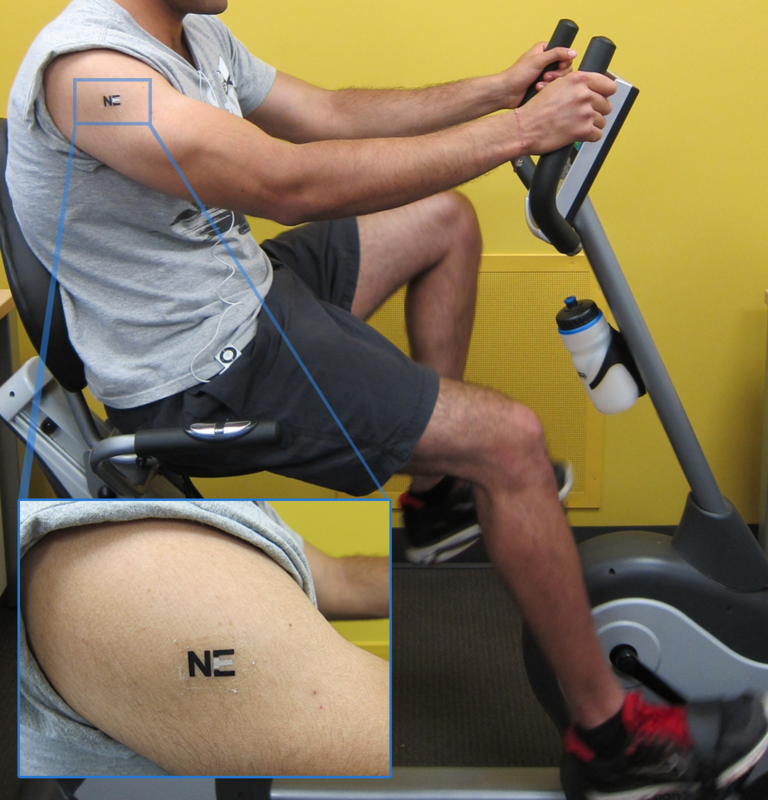 When 15 volunteers wore the tattoo biobatteries while exercising on a stationary bike, they produced different amounts of power. Interestingly, people who were less fit (exercising fewer than once a week) produced more power than those who were moderately fit (exercising one to three times per week). Enthusiasts who worked out more than three times per week produced the least amount of power. The researchers say that this is probably because the less-fit people became fatigued sooner, causing glycolysis to kick in earlier, forming more lactate. The maximum amount of energy produced by a person in the low-fitness group was 70 microWatts per cm2 of skin. Biobatteries offer certain advantages over conventional batteries: They recharge more quickly, use renewable energy sources (in this case, sweat), and are safer because they do not explode or leak toxic chemicals. “These represent the first examples of epidermal electrochemical biosensing and biofuel cells that could potentially be used for a wide range of future applications,” Wang says. The researchers acknowledge funding from the National Science Foundation and Office of Naval Research. A tattoo biosensor (enlarged above) detects lactate levels during exercise; a biobattery using the technology could power electronics.